NOTE: Maximum custom depth is 5 1/4". Standard width options are 23.5", 29.5", and 35.5". 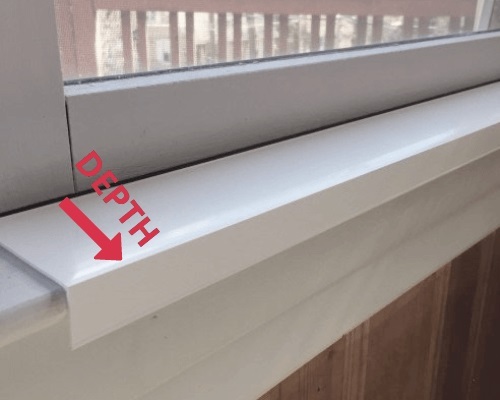 Custom depth windowsill protectors, available in clear or white. 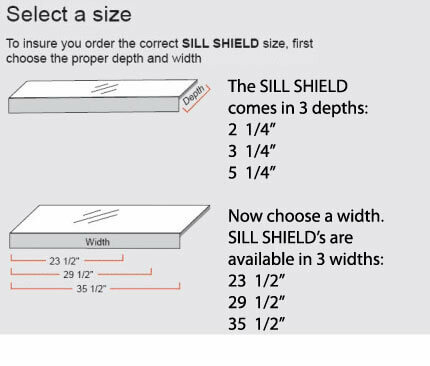 Enter your custom Sill Shield™ depth (front edge of the sill toward your window - maximum 5 1/4"), and choose a standard width (left to right along the length of the windowsill: 23.5", 29.5", or 35.5"). All of my Sill Shields have a 1” drop in the front to wrap around the corner of the sill. You can order online, or by phone at 845-477-0737. After years of constantly repainting my sills, they finally got to the point where the wood was so damaged, they had to be replaced. I wasn’t able to find a product to protect the new ones, so I created the first Sill Shield™. My sills are white, so I chose a white outdoor grade U.V. material to resist yellowing. For the clear Sill Shields, I chose a material called PETG, a tough, clear material best known for making blister packs. The quality of my original Sill Shield™ is superior to any other windowsill protector, and that’s why I’m the only one that offers my exclusive lifetime guarantee: As long as I’m alive, they’re guaranteed - when I’m gone, you’re on your own. Perfect for my needs! 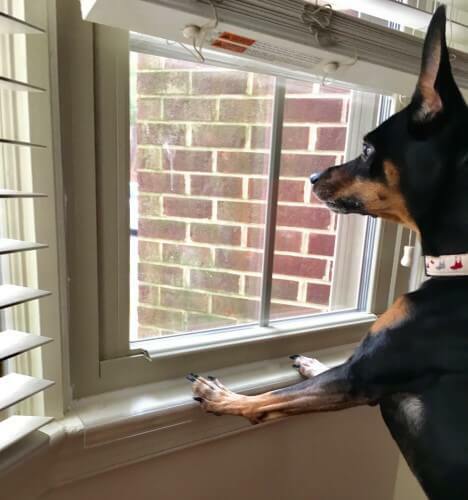 My dog bites the windowsills. This prevents that and covered the damage he already inflicted on the wood! Thanks and I will be ordering more. This was the perfect solution to my terribly scratched up windowsill problem. My dog had my big picture window sill all scratched up. 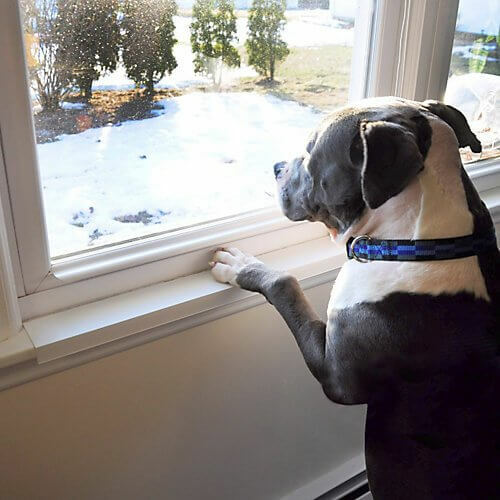 It was so easy to install and it is tough enough to withstand my dog's constant jumping up at the sill every time he sees movement outside! I ordered a custom depth and it came a perfect fit. I highly recommend. Our Labrador likes to lay on the floor in front of our windows. She places her paws on the window sills while looking outside. After 4 years she has scratched off much of the paint on the sills. We are hoping that these sill shields will protect our new windows and sills we just installed. The shields seem to be just what we need. 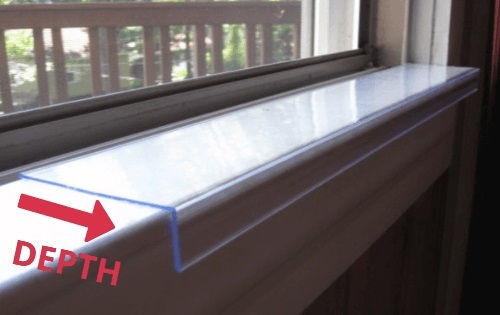 They are sturdy and are barely noticeable on our white sills. Great product with custom sizes! I could not find an angle guard anywhere online that is one width one way and another width the other way. Sillshield made me custom sizes just to fit my back door trim that my dogs scratch the paint off. The guards are well made and look really nice.